Allah Akhbar- 6 Million Bucks! 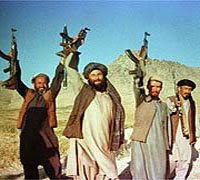 The Pakistani Government paid the Taliban $6 million bucks for killing its members who were fighting against the government. Pakistani militants in the country’s northwest are understood to have received 480 million rupees (6 million dollars) in compensation after agreeing to a cease conflict with government forces for an indefinite period. Well-placed security sources have told Adnkronos International (AKI) that the militants agreed to lay down their arms and endorse the deal between the government and local leader Sufi Mohammad to impose Sharia law in the region. “The amount has been paid through a backchannel, ” a senior security official told AKI on condition of anonymity.